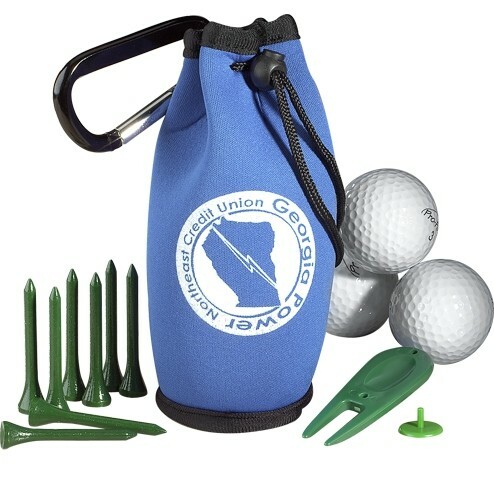 Golf kit in carabiner bag with 3 Golf Balls.and 8 biodegradable tees, ball marker & divot tool. Bag: Set-up charge $50(V) per color/location. Additional color/location run charge $.50(V) per piece. Re-order set-up charge $30(V) per color/location. (Run charges apply). Divot Tools: (One color imprint only) Set-up charge $50(V). Re-order set-up charge $30(V). Markers: (One color imprint only) Set-up charge $50(V). Re-order set-up charge $30(V). Golf Balls: Set-up charge per color $50(V). Additional color run charge $.16(V) each ball (Up to 3 colors). Re-order setup charge $30(V) per color (Run charges apply).